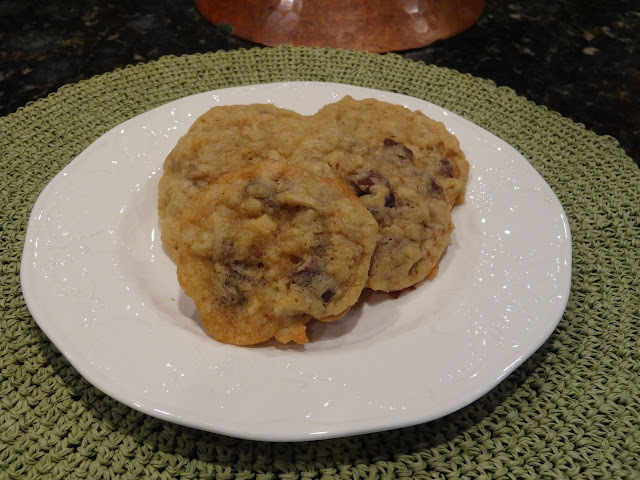 Perfect for any time of the year, the oatmeal in these cookies yield a tender bite and the coconut lends a a wonderful chewy texture. My mom, sister and I made these cookies two weeks ago. As chocolate chip cookie fans, we’re always in the mood to try new cookie recipes, and this one from The SoNo Baking Company Cookbook did not disappoint. While yielding 2 dozen cookies, we managed to have leftovers, so I took some to my coworkers the next day. I must tell you, my coworkers are “smart cookies”. 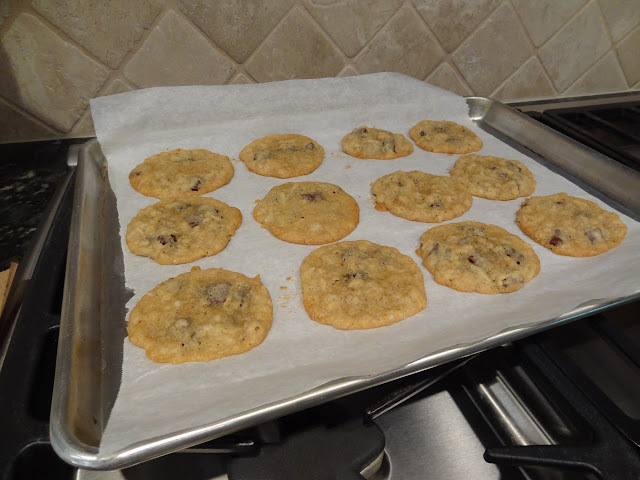 The previous week I made Neiman Marcus chocolate chip cookies and portioned one cookie per person. Well, somehow I either mis-counted or someone ate two cookies, because one guy didn’t get his. I felt sorry for him and made him a half-dozen the next day. Well, the other coworkers learned from that, and when I brought these chocolate chip oatmeal cookies in, they all waited until the afternoon to eat their cookie. Why??? They were in hopes someone would eat the cookie meant for them, and then I would make another half-dozen. Clever!!! For crisper cookies, bake longer. When adding mix-in elements like oats, chocolate chips, nuts or coconut to the dough, be sure to fold them in gently with a rubber spatula, rather than with a standing mixer. The force of the mixer can break these ingredients into smaller pieces, thus changing the overall desired texture of the cookie. 1. Set the oven in the middle position. Preheat the oven to 350 degrees F. Line two baking sheets with parchment paper or nonstick silicone baking mats; set aside. 3. In a bowl of a standing mixer fitted with the paddle attachment, beat the butter, granulated sugar, brown sugar, and salt on medium-high speed until light and fluffy, 2 to 3 minutes, scraping down the sides of the bowl halfway through. Add the eggs one at a time, beating after each addition. Beat in the vanilla. 4. With the mixer on low speed, add the dry ingredients, beating until the flour is absorbed. Gently fold in the chocolate chips and shredded coconut with a rubber scraper. Gently fold in the oats. 5. Use a 1/4 cup (2 inch wide) ice cream scoop to scoop out the dough onto the prepared baking sheets, placing the scoops about 2 inches apart. 6. Bake one sheet at a time, rotating the sheet about two-thirds of the way through the baking time, until the cookies are set and browned on the edges but still very soft in the center, 15-18 minutes. 7. Transfer the baking sheet to a wire rack to cool for 10 minutes. Use a spatula to transfer the cookies to the rack and let cool completely.